One of my favorite Colombian dishes and comfort foods is this fabulous chicken stew, Sancocho. When I was living and teaching in Santa Marta, Colombia, on the Caribbean coast, I ate this soup at least once a week. The little restaurant to the left of my building on Calle 9 con carrera 2 en El Rodadero, used to have it pretty much as a daily special. It was also a big deal when it was made in the cafeteria at our school Colegio Bureche, or a special treat for teachers on inservice days. I will also never forget years back, when a number of family members came to my in-laws home in Bogotá for Semana Santa. Mi suegra (mother in-law), and the aunts and cousins were in the kitchen all day, preparing this dish. They had two whole plucked, headless, chickens, feet and all, and were holding them over the flame on the kitchen stove. In an enormous pot, went the number of ingredients, the pungent smell filling the air. Mmm… a bowl of sancocho, arepas, white rice, and a glass of tomate de árbol en leche (tree tomatoes: one of many delicious, exotic fruits grown in Colombia used to make juice), I still dream about meals like that one. Sancochar in Spanish means to parboil. I guess you can almost equate this to a New England Boil Supper, Latin style. Full of flavor and goodies, the sweetness of the plátanos (plantains), the saltiness of the broth, the tang of the lime and the flavor of the cilantro...you just have to keep coming back for more. Traditionally you use a whole chicken to make Sancocho. Using leftovers from a roast chicken works great too, and that is usually how I make it. However, there are times when I am craving this soup, and I just start from scratch. With all your vegetables washed, prepped and ready to go, add the olive oil to a large pot, and heat on low. Add in the onions increase heat to med-high and sauté until slightly soft, about 2 minutes. Add the celery and sauté another 2-3 minutes. Add in the yucca and the potatoes along with 2 cups of water. Bring to a slight boil. Add in the salt and the garlic. Reduce the Let simmer for about 5 minutes. Add the remaining 6 cups of water. When the water has come to a boil, add in the chicken, 1/2 cup cilantro, pepper, and the juice from one lime. Let cook on a low boil for about 10-15 minutes. Add in the carrot and the plantain. Let cook another 10 minutes, or until the plantain becomes puffy and soft. At this point I remove the chicken, and let it cool slightly on a plate, and then remove the meat from the bone, I put the meat and the bone back into the soup. Add in the corn, and let cook another 10 minutes or so. Be sure to remove any bones. (For those of you who don't know what these are, they are the Venezuelan or Colombian variation of a corn tortilla, amazing, I will follow up on that another day). Tradicionalmente usa la gallina entera para preparar la sopa. Generalmente yo uso las partes dejadas del día anterior, cuando preparo un pollo del horno. Pero aveces el antojo me llama y empiezo de cero. Con todos las verduras lavadas y preparadas, pon el aceite en una olla grande y calienta a fuego bajo. Agrega las cebollas y saltea a fuego medio por 2 minutos. Agrega el apio, y cocina otro 2-3 minutos. Agrega la yucca y las papas, seguidas por 2 tazas de agua. Pon a hervir. Cocina por 5 minutos. Agrega las otras 6 tazas de agua. Cuando se pone a hervir, agrega el pollo, 1/2 taza de cilantro, la pimienta y el jugo de un limón. Cocina por 10-15 minutos. Pon la zanahoria y plátano. Cocina 10 minutos, o hasta el plátano está blandito. A mí me gusta quitar el pollo de la olla, y quitarlo del hueso. Primero, déjalo enfriar un poco. Cuando la carne está suelta, pon la carne y los huesos en la sopa otra vez. Agrega la mazorca y cocina 10 minutos. Quita los huesos antes la sirves. Pon la sopa en la taza. Termina con aguacate rebanadas del aguacate, cilantro picado y una porción de limón. Sirve con arroz blanco y arepas medianas. This morning before bringing my daughter to preschool, she asked me if we could invite our good friends Tim and Claire over for dinner. So while wandering around the Farmer's Market at Monument Square, I gave Claire a ring to see if they were available. Fortunately, they were! 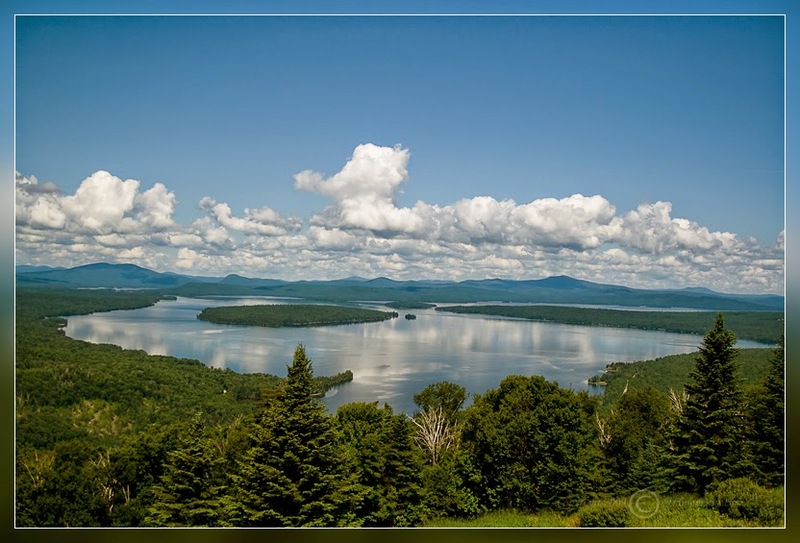 Now where to begin, where would my inspiration lie today? Lots of colorful veggies at the market. I was in the mood for a little meat protein. There was a lot of fresh basil in my garden at home and I had been pondering the idea of pesto the last couple of days. However, Tim wasn't able to eat pesto with nuts, so I was now inspired to create a nut-free pesto. 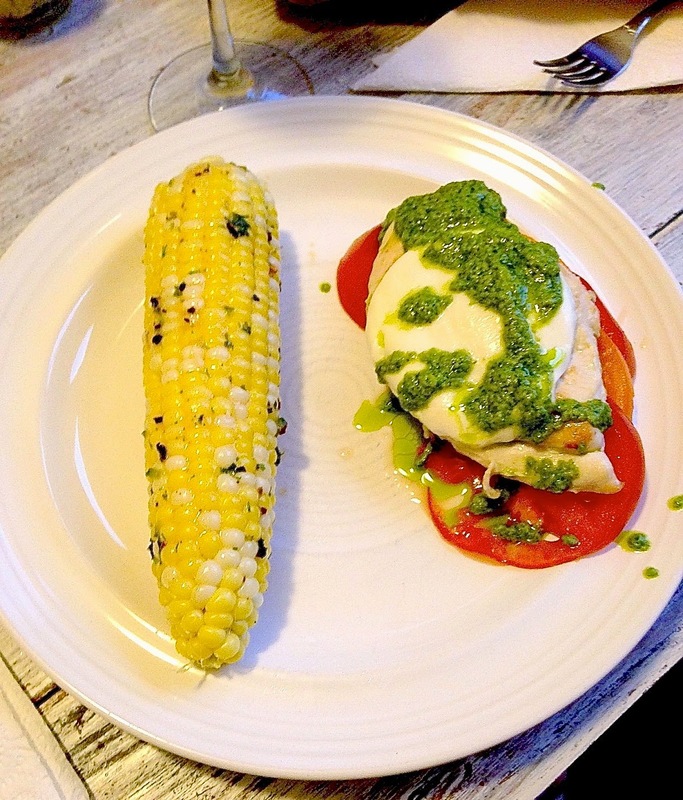 Okay, pesto, chicken…I knew that I wanted to get some fresh corn, since like every season in Maine, with the exception of winter, that of corn on the cob is short-lived. Juicy, sun-ripened tomatoes were also on the docket, as the ones growing in my garden are still all as green as emeralds. With these ideas floating around in my head, I still couldn't quite figure out what to make. How was I going to fit each of these ingredients together in a way that would go? I began with the pesto. Parmesan, extra virgin olive oil, garlic. Would these give me the consistency that I wanted and the right flavor? 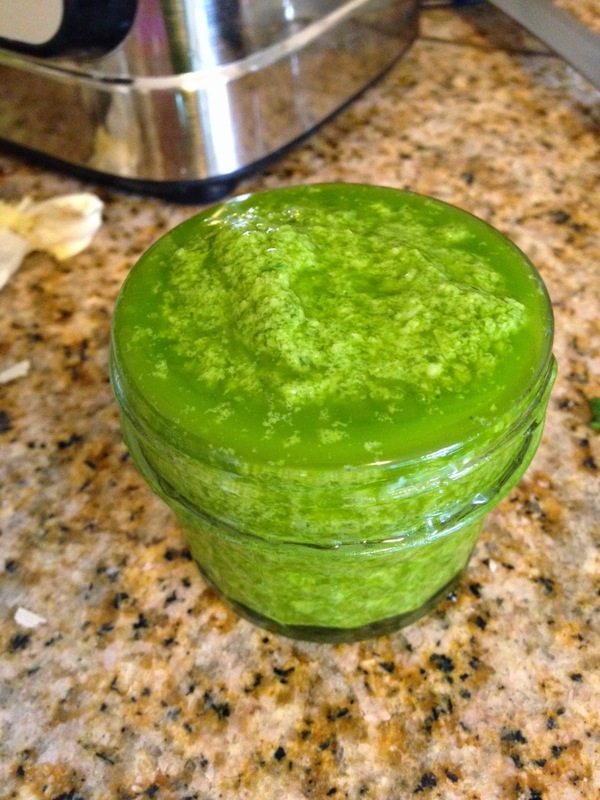 I whirred the olive oil, basil and pressed garlic up together, using the ice-crush button on my blender. Then added in the cheese, and it was just too green. I added a little more olive oil and some lemon juice. No, I thought to myself, this just doesn't taste right. Oh no, this is going to be a disaster. After an hour and a half of tutoring, 2 cups of coffee and no lunch, I was feeling like I had bitten off more than I could chew for this humid afternoon. The pesto was a wonderful color, so I set it aside, thinking I should add this, that or the other thing to it to get it the right flavor, texture, not so garlicky. No, I said to myself, just leave it. Kind of like art, often when you add too much, it becomes ruined. couldn't get the flavors right, and who serves chipotle-lime flavors with pesto! Italian and Latin cuisine…ugh I though, as I sent Claire a stressed out text message, forewarning her of the possible dinner disaster. I now set aside, the chipotle butter and washed up the dishes before running out to pick up Zsuly. When we got home, it dawned on me, exactly how I was going to pull this off. 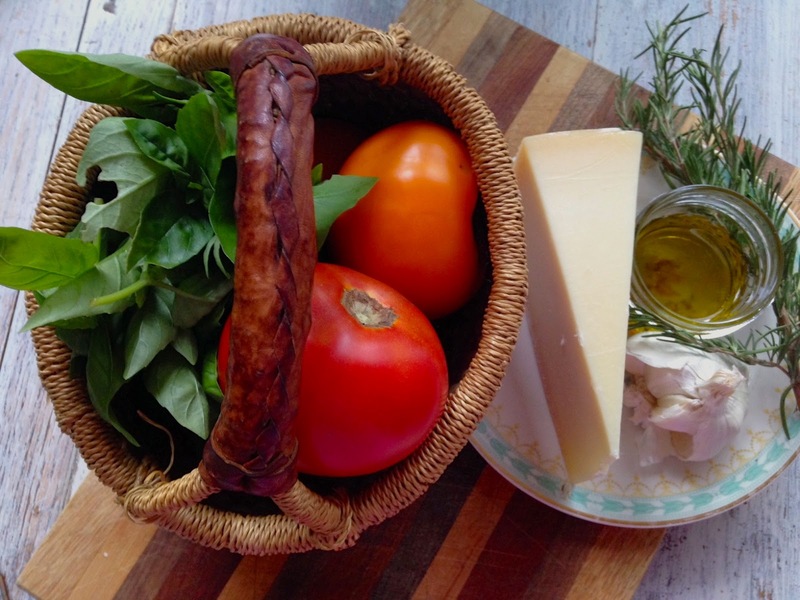 Scratch the cucumber tomato salad, or the Caprese salad. 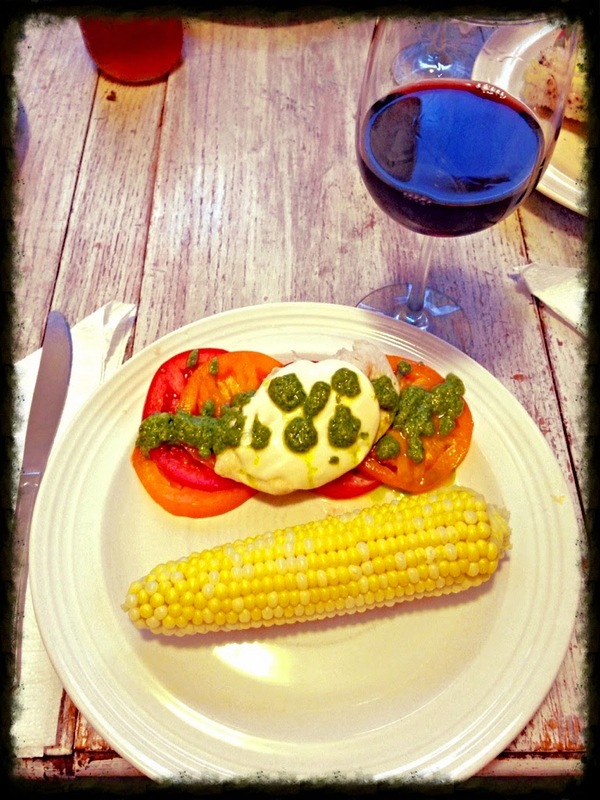 Caprese chicken…its going to be perfect I thought. The colors, the textures, the clean, fresh flavors. It turned out, thankfully to be a success and both my dinner guests and my daughter, as well as myself, were all satisfied with the results. With lots of gratitude and mmm's everyone ended the evening with a happy belly. This recipe will serve 4 hungry adults and at least one child. 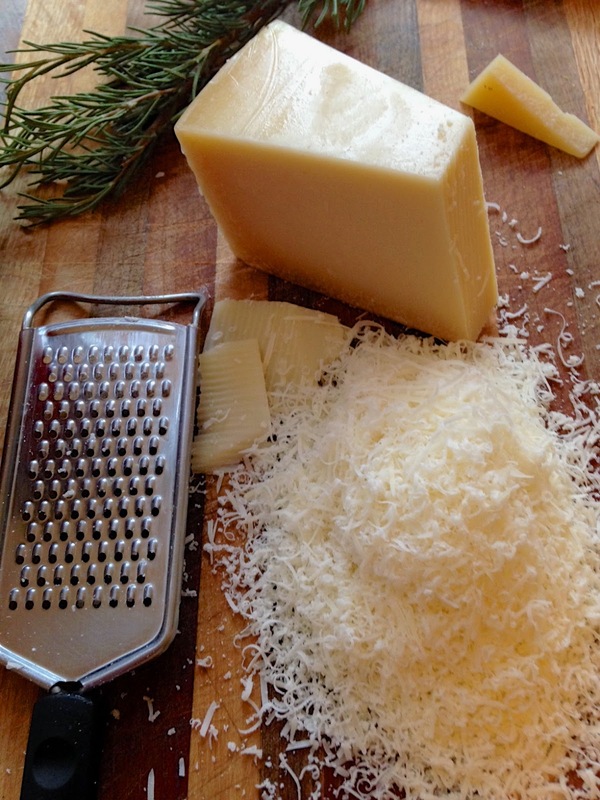 Grate the parmesan cheese until you have about 3/4 cups (tightly packed). Wash and pat the basil dry. 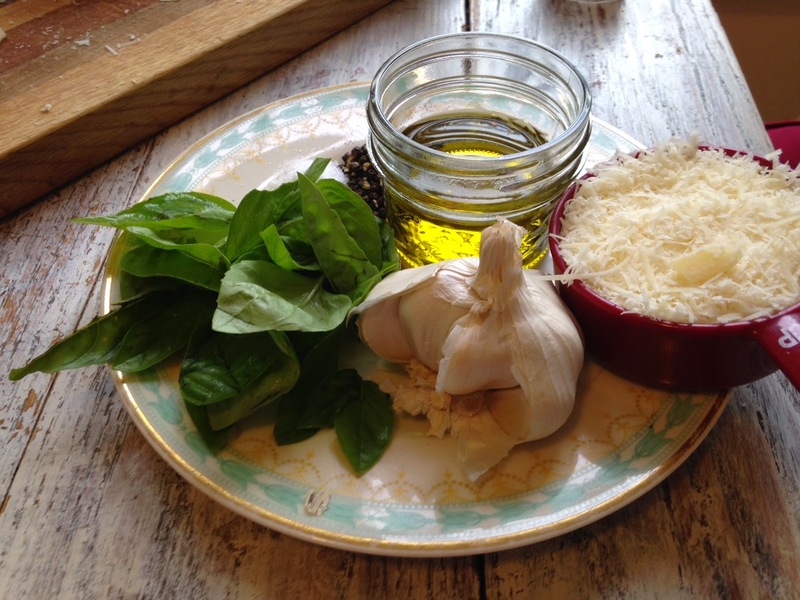 In a blender (if you use a food processor, you will not need to pre-grate the cheese) combine the olive oil, and half the basil. Also add in the garlic (either mince with a knife before adding to blender or use a garlic press). Use the Ice-crush button of the blender to pulse the basil leaves until chopped. Then add the remainder of the basil. When all basil is chopped add in the cheese, pepper, and salt. Again use the ice-chop button to pulse until desired consistency is reached (pretty thin). Add in the juice of 1 lemon and mix on high. The lemon will take away some of the bitterness or greeny flavor of the basil. In a small bowl, combine the butter, jalapeño, cilantro, chipotle, and mix well. Add in juice of the lime, and a tiny bit (1/4 tsp.) of lime zest. Mix well. Add in remaining ingredients and mix well. Keep in mind the chili and the paprika are more for color than flavor. Cover and refrigerate. Fill a large pot with 2 inches of water. Place corn in the pot and put over a high flame. When the water begins to boil, keep over high flame for 12 minutes. Then turn off heat and drain water. While corn is cooking, slice tomatoes into 1/4 inch slices. Lay on plate, alternating colors. Set aside. Slice mozzarella into 1/8 inch slices and set aside. Slice each chicken breast in half lengthwise, to make a thinner cut. Heat about a teaspoon of olive oil over medium heat in a large skillet or frying pan. Add in rosemary sprigs and as many chicken breasts as will fit, leaving space to flip. As the edges of the chicken begin to whiten, they will also be browning. Sprinkle with salt. Flip breasts every 2 minutes or so. Total cooking time for the chicken breasts will be about 5-7 minutes. Pan cook until lightly brown on each side, and cooked through. Turn off heat, and put a slice of the fresh mozzarella on each breast. Cover and let sit 5 minutes. This will melt the cheese and lock in the juices for assure chicken is tender and not dry. 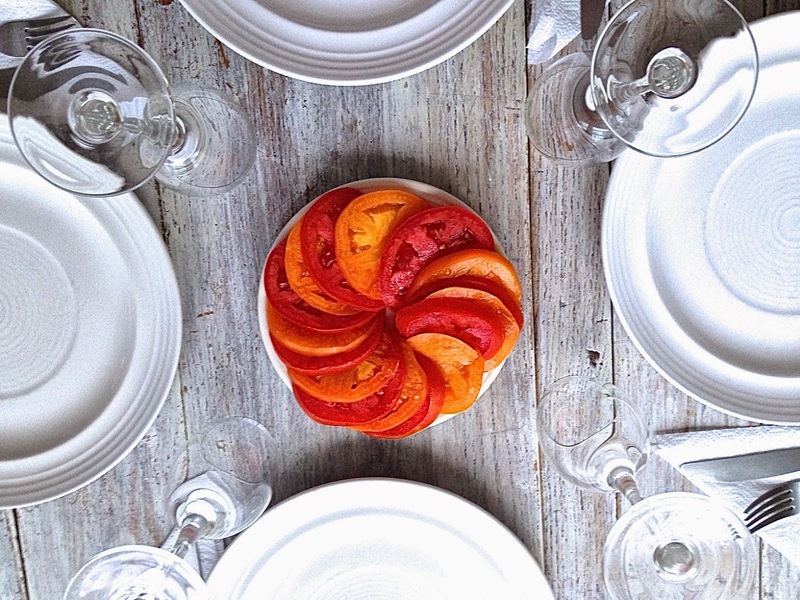 Take 4-5 slices of the tomatoes and lie on plate, fanned out. Remove chicken breast from pan, lying one breast per plate over tomatoes. Mix pesto well, then drizzle over the chicken breast and tomatoes. 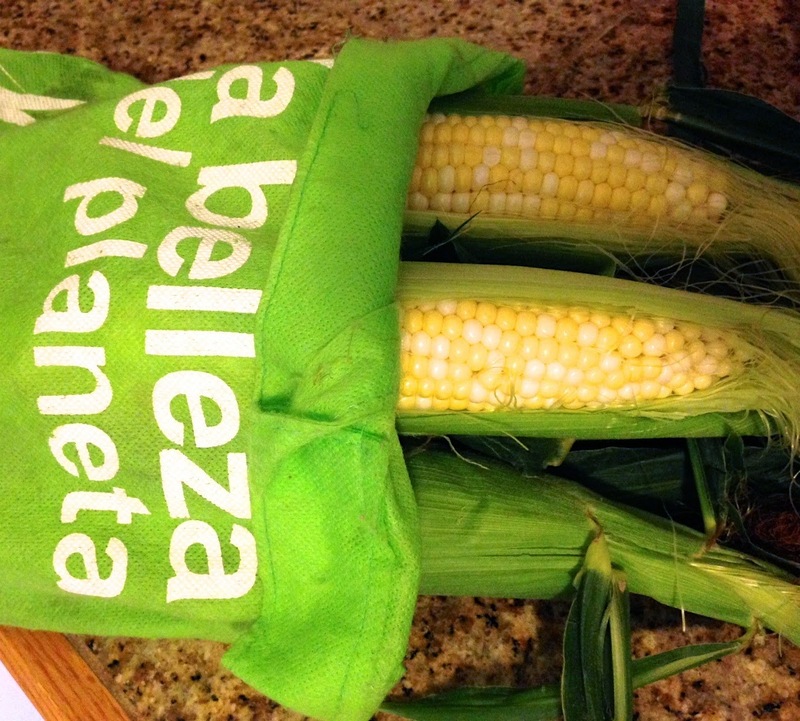 Remove corn from pot and place on plate. 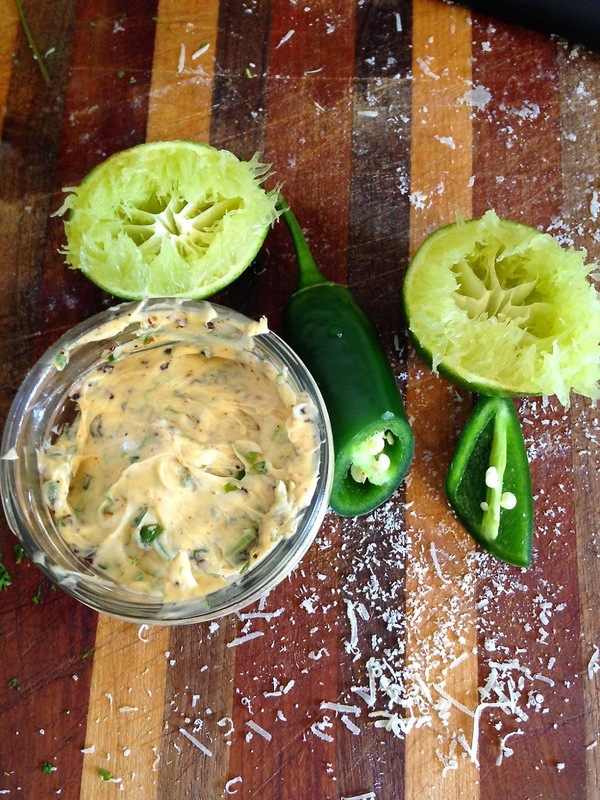 Slather with the Chipotle-lime butter. Serve with a lovely, fresh green salad and either a dry, crisp white wine or full-bodied red. Enjoy! Hot summer days mean its time to eat cool treats. One of my favorite fruit combinations is pineapple and coconut, the famous pina colada. Coconut has gotten a lot of hype lately, with the sales of coconut water and oils skyrocketing in recent years. There is now some conflicting evidence being revealed about some of those amazing cure claims and health benefits. I won't go into that, you can do your own research. If you are looking for a low-fat, low-calorie treats, these aren't them, but don't let that stop you from indulging in these satisfying pops! 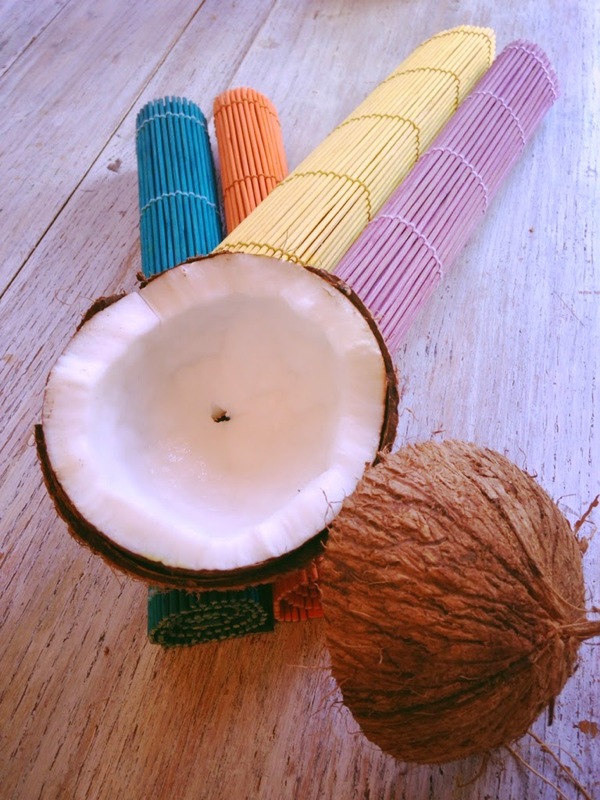 Coconuts have an extremely high saturated fat and caloric content. Generally speaking, you want to stay away from foods high in saturated fats and stick with monounsaturated and polyunsaturated fats, as research has shown that these fats actually lower bad cholesterol and risk of heart disease. According to the USDA website listing nutritional value data, 1 cup of raw shredded coconut has 24 grams of saturated fat! Nevertheless, some studies have shown that the type of fatty acids, and composition of the fats in coconuts actually help to maintain a healthy cholesterol level! And the serving of coconut contained in these popsicles contain, 285 milligrams of potassium and 7.2 grams of fiber. 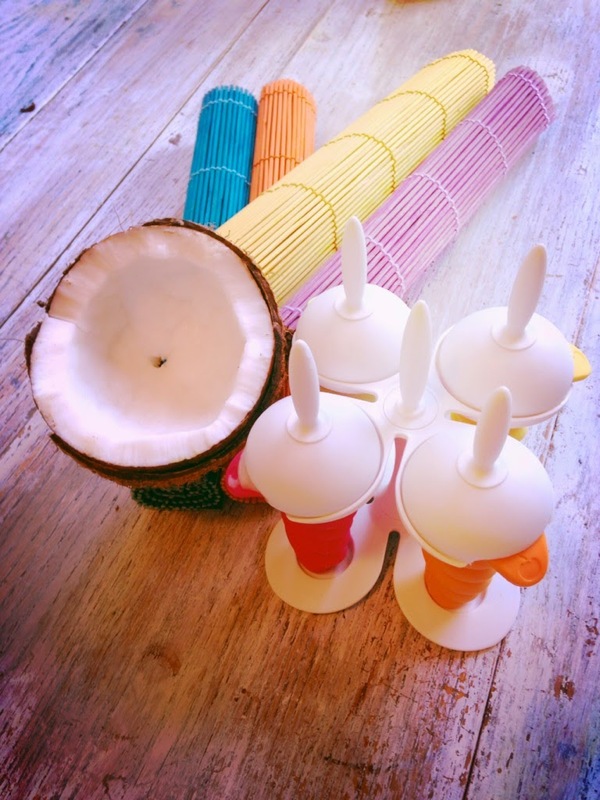 So indulge in these creamy, tropical, naturally sweetened Piñacoolada Pops. After all, summer only comes but once a year! Meat from half a coconut, with brown skink removed. Drain the coconut water from the coconut, by piercing a hole in the eye. Crack open the coconut with a hammer, remove meat. In a blender combine the canned coconut milk, pineapple including the juice, and the dates. Blend on high until smooth, about 1 minute. Add coconut meat to blender, blend about 30 seconds to 1 minute. Add a pinch of salt. Pour blended mixture into popsicle molds and freeze. When frozen, enjoy with a smile.